This article is about the fourth moon of Pluto. It is not to be confused with the asteroid 1865 Cerberus. Kerberos is a small natural satellite of Pluto, about 19 km (12 mi) in its longest dimension. It was the fourth moon of Pluto to be discovered and its existence was announced on 20 July 2011. It was imaged, along with Pluto and its four other moons, by the New Horizons spacecraft in July 2015. The first image of Kerberos was released to the public on 22 October 2015. Kerberos was discovered by researchers of the Pluto Companion Search Team using the Hubble Space Telescope on 28 June 2011, using the Wide Field Camera 3, during an attempt to find any rings that Pluto might possess. The search for rings was motivated in part by a desire to avoid damage to New Horizons when it passed through the Pluto system in July 2015. Further observations were made on 3 and 18 July 2011 and Kerberos was verified as a new moon on 20 July 2011. It was later precovered or identified in earlier archival Hubble images from 15 February 2006 and 25 June 2010, though Kerberos was obscured by diffraction spikes in those images. Kerberos's brightness is only about 10% of that of Nix, and it was only found because the discovery team took eight-minute exposures; earlier observations had used shorter exposures. It was officially designated S/2011 (134340) 1, and was informally referred as P4. The provisional designation of the satellite varied based on the source used. The International Astronomical Union announced it as S/2011 (134340) 1, whereas the New Horizons mission website announced it as S/2011 P 1. Like Pluto's other moons, it is suspected that Kerberos coalesced from the debris of a massive collision between Pluto and another Kuiper belt object, similar to the giant impact thought to have created the Moon. Further observations were made on 3 and 18 July 2011 and Kerberos was verified as a new moon on 20 July 2011. Kerberos has a double-lobed shape and is approximately 19 km (12 mi) across its longest dimension and 9 km (5.6 mi) across its shortest dimension. The larger lobe of Kerberos is approximately 8 km (5 mi) across while the smaller lobe is measured to be approximately 5 km (3.1 mi) across. The double-lobed shape of Kerberos is likely formed by two smaller objects merged, suggesting that Kerberos along with Pluto's other moons may have been formed by the coalescence of debris around Pluto. Kerberos has a high albedo or reflectivity similar to Pluto's other small moons, likely due to the presence of water ice on its surface. 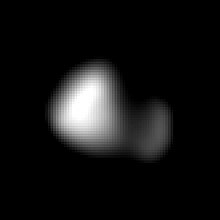 Before the New Horizons flyby, Kerberos was initially thought to have a larger size and a darker surface. Like the other small moons of Pluto, Kerberos is not tidally locked and its rotation is chaotic, varying quickly over geological timescales. The varying gravitational influences of Pluto and Charon as they orbit their barycenter causes the chaotic tumbling of Pluto's small moons, including Kerberos. At the time of the New Horizons flyby, the rotational period of Kerberos was about 5.33 days and its rotational axis was tilted about 96 degrees to its orbit. The high axial tilt of Kerberos meant that it was rotating sideways relative to its orbit around the Pluto-Charon barycenter. Observations indicate a circular, equatorial orbit around the Pluto-Charon barycenter at a distance of 57,783 km (35,905 mi). All of Pluto's moons including Kerberos have very circular orbits with very low orbital inclinations to Pluto's equator. Kerberos orbits between Nix and Hydra and makes a complete orbit around Pluto roughly every 32.167 days. Its orbital period is close to a 1:5 orbital resonance with Charon, with the timing discrepancy being about 0.7%. [notes 2] As with the near resonances between Nix or Hydra and Charon (1:4 and 1:6, respectively), determining how close this relationship is to a true resonance will require more-accurate knowledge of Kerberos's orbit, in particular its rate of precession. The New Horizons spacecraft took images of Kerberos during its flyby of the Pluto system on 14 July 2015. Three months later, on 22 October, the first image of the moon was published. It is the last moon of Pluto to have its image released, revealing that Kerberos was small and had a bright surface contrary to the initial idea that the moon was covered in dark material. Upon discovery, Kerberos received the minor planet designation S/2011 (134340) 1 because it was the first satellite (S) discovered orbiting the minor planet 134340 Pluto in 2011. It was initially called "P4", meaning the fourth Plutonian moon to be discovered. The convention for naming Plutonian moons is to use names associated with the god Pluto in classical mythology. To decide on names for P4 and P5, Mark Showalter and the SETI Institute, on behalf of the discovery team, conducted a non-binding Internet poll in 2013, in which the general public was invited to vote for their favorite names. The public could choose from a selection of Greek mythological names related to the god Pluto, or could propose their own names. After the initial announcement, William Shatner, the actor who played Captain James T. Kirk in the Star Trek franchise, proposed the names Vulcan and Romulus, ostensibly referring to the fire god Vulcan (a nephew of Pluto), and to Romulus the founder of Rome, but also alluding to the fictional planets of Vulcan and Romulus in the Star Trek universe. The 'Romulus' suggestion was discounted, because there is already an asteroid moon of that name, but Vulcan won the poll after Shatner tweeted about it, with Cerberus (the dog that guards Pluto's underworld) coming second and Styx (the goddess of the river of the underworld) coming third. The winning names were submitted to the International Astronomical Union. However, 'Vulcan' was unacceptable to the IAU because it was not the name of an underworld deity and had already been used for a hypothetical planet inside the orbit of Mercury, as well as having given its name to the hypothetical vulcanoids. Cerberus is already the name of an asteroid, 1865 Cerberus, but the Greek form of the name, Kerberos, was acceptable to the IAU. On 2 July 2013, the IAU announced that it formally approved the names Kerberos for P4 and Styx for P5. The names of features on the bodies in the Pluto system are related to mythology and the literature and history of exploration. In particular, the names of features on Kerberos must be related to dogs from literature, mythology and history. ^ a b c d e f g h Showalter, M. R.; Hamilton, D. P. (20 July 2011). "New Satellite of (134340) Pluto: S/2011 (134340) 1". Central Bureau for Astronomical Telegrams. International Astronomical Union. Retrieved 20 July 2011. ^ a b "DPS 2015: Pluto's small moons Styx, Nix, Kerberos, and Hydra [UPDATED]". www.planetary.org. ^ a b Showalter, M. R.; Hamilton, D. P. (3 June 2015). "Resonant interactions and chaotic rotation of Pluto's small moons". Nature. 522 (7554): 45–49. Bibcode:2015Natur.522...45S. doi:10.1038/nature14469. PMID 26040889. ^ a b c d "2016 Lunar & Planetary Science Conference by National Institute of Aerospace". ^ Brozović, Marina; Showalter, Mark R.; Jacobson, Robert A.; Buie, Marc W. (January 2015). "The orbits and masses of satellites of Pluto". Icarus. 246: 317–329. Bibcode:2015Icar..246..317B. doi:10.1016/j.icarus.2014.03.015. ^ a b c Weaver, H. A.; Buie, M. W.; Showalter, M. R.; Stern, S. A.; et al. (18 April 2016). "The Small Satellites of Pluto as Observed by New Horizons". Science. 351 (6279): aae0030. arXiv:1604.05366. Bibcode:2016Sci...351.0030W. doi:10.1126/science.aae0030. PMID 26989256. ^ Cain, Fraser (2008). "Pluto's Moon Nix". ^ a b Talbert, Tricia. "Last of Pluto's Moons – Mysterious Kerberos – Revealed by New Horizons". NASA. Retrieved 23 October 2015. ^ Wall, M. (20 July 2011). "New Pluto Moon Foreshadows More Surprises for NASA Probe En Route". Space.com. Retrieved 21 July 2011. ^ a b Stern, Alan; Grinspoon, David (May 1, 2018). "Chapter 12: Into Unknown Danger". Chasing New Horizons: Inside the Epic First Mission to Pluto. Picador. ISBN 9781250098962. ^ "Pluto Has Another Moon, Hubble Photos Reveal | Dwarf Planet Pluto | Pluto's Moons". Space.com. Retrieved 12 July 2012. ^ "Hubble Space Telescope discovers fourth moon of Pluto". earthsky.org. Retrieved 22 February 2019. ^ a b c Lakdawalla, E. (20 July 2011). "A fourth moon for Pluto". planetary.org. The Planetary Society. Retrieved 20 July 2011. ^ Showalter, M. (20 July 2011). "NASA's Hubble Discovers Another Moon Around Pluto". hubblesite.org. Retrieved 20 July 2011. ^ "Kerberos In Depth". solarsystem.nasa.gov. NASA. December 5, 2017. Retrieved February 21, 2019. ^ "New insights into Pluto's outer moons". cosmosmagazine.com. Cosmos Magazine. June 17, 2016. Retrieved February 21, 2019. ^ "Kerberos Revealed". pluto.jhuapl.edu. NASA/Johns Hopkins University Applied Physics Laboratory/Southwest Research Institute. October 22, 2015. Retrieved October 22, 2015. ^ a b "NASA's Hubble Finds Pluto's Moons Tumbling in Absolute Chaos". www.nasa.gov. NASA. ^ a b "International Astronomical Union - IAU". www.iau.org. ^ "Help Us Name the Moons of Pluto!". Archived from the original on 16 February 2013. ^ Overbye, Dennis (2 July 2013). "Two of Pluto's Moons Get Names From Greek Mythology's Underworld". New York Times. Retrieved 26 February 2019. Showalter, Mark. NASA's Hubble Discovers Another Moon Around Pluto. 20 July 2011. Kerberos In Depth. Updated 5 December 2017.